Ruthenia and Karnia maintained separate parliaments each with its own prime minister under the monarch after the Karno-Ruthenian Compromise of 2016. After the Imperial Constitution of 2017, the parliaments were unified into one, the Imperial Diet, a bicameral parliament with representatives of all the regions of the Empire. In accordance with article 80, Chapter V of the Constitution, the Imperial Diet is the political body with the highest authority in government, responsible for administering legislative power, and is divided into an upper chamber, the House of Peers, and a lower chamber, the House of Representatives. The competences of the Imperial Diet are: authorize the declaration of war and the celebration of peace, override State of Exception declaration, authorize the ratification of international treaties, authorize the resignation of the Emperor and recognize the Crown Prince, authorize the marriage of the Emperor and the Crown Prince, supervise the activities of the Cabinet, give effect to motion of no confidence, elect by relative majority the Imperial Chancellor and enact constitutional amendments. The government comprises ministers for joint responsibilities (culture, finances, foreign affairs, immigration, imperial and royal household, information, interior and of defense). On June 2016, two ministries were created: the Ministry of Strategic Affairs, responsible for the development of new approaches from the Imperial and Royal Government to its citizens and foreigners and the Ministry of Antarctic Affairs, to protect, defend and clarify the situation of the Antarctic continent and specially the current status of the Grand Duchy of Gaussland. The last ministry created was of the justice, on 09 December 2016, related to the Imperial Supreme Court. This structure was maintained after the promulgation of the new constitution. The offices of Minister-President of Ruthenia and the Prime Minister of Karnia were created after the Comrpomise, but replaced by the office of Imperial Chancellor. 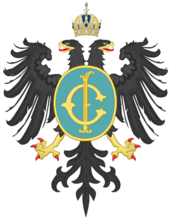 The Imperial Chancellor of Karnia-Ruthenia, is the head of government of the Karno-Ruthenian Empire and leader of the Cabinet, appointing and dismissing its members. The Imperial Chancellor do not have a fixed mandate, leaving the office by resignation or motion of no confidence of the Imperial Diet. Among its competences, are exercise the highest authority in matters concerning the Government, head the Cabinet, appoint and dismiss the members of the Cabinet, upon the consent of the Emperor, advise and be advised by the Emperor, create and regulate imperial agencies, propose bills to the Imperial Diet, monthly take part in the Imperial Diet, in Ordinary Session, to answer the Questions to the Imperial Chancellor. 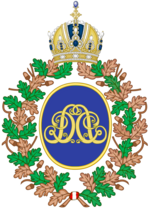 Coat of Arms of the Imperial Diet. Established by the Imperial Constitution of 2017, in accordance with article 80, Chapter V, the Imperial Diet is the political body with the highest authority in government, responsible for administering legislative power, and is divided into an upper chamber, the House of Peers, and a lower chamber, House of Representatives. The Imperial Diet is governed by its Internal Regiment, which shall be voted by its own members in the first Ordinary Session and is presided by the Palatine of the House of Peers. The competences of the Imperial Diet are: authorize the declaration of war and the celebration of peace, if approved by 2/3 of its members, override State of Exception declaration, if approved by 2/3 of its members, authorize the ratification of international treaties, authorize the resignation of the Emperor and recognize the Crown Prince, authorize the marriage of the Emperor and the Crown Prince, supervise the activities of the Cabinet, give effect to motion of no confidence, elect by relative majority the Imperial Chancellor and enact constitutional amendments. The Imperial Chancellor of Karnia-Ruthenia, is the head of government of the Karno-Ruthenian Empire and leader of the Cabinet, appointing and dismissing its members. The Imperial Chancellor do not have a fixed mandate, leaving the office by resignation or motion of no confidence of the Imperial Diet. The competences of the Imperial Chancellor are: exercise the highest authority in matters concerning the Government, head the Cabinet, appoint and dismiss the members of the Cabinet, upon the consent of the Emperor, advise and be advised by the Emperor, create and regulate imperial agencies, propose bills to the Imperial Diet, monthly take part in the Imperial Diet, in Ordinary Session, to answer the Questions to the Imperial Chancellor.